Manchester City manager Manuel Pellegrini says Liverpool's impressive contingent of English players was not the reason the Reds beat his team 3-2 at Anfield on Sunday. The Chilean has spoken previously about the value of having Englishmen in Premier League sides. "It is important to have English players in all English teams," he said. "But that is not why Liverpool won the game. In this game, three or four important decisions went against us." The defeat left City in third place in the table, seven points adrift of leaders Liverpool but with two games in hand. Pellegrini, in his first season in charge of City, said it was not easy to buy English talent and that his first priority was to buy the best players for City, wherever they were from. 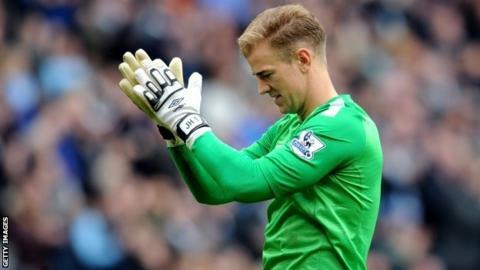 Nevertheless, while Liverpool started with six Englishmen at Anfield, other than goalkeeper Joe Hart, English players have been noticeable by their absence from the Blues starting line-up recently. James Milner, who made a big impact as a substitute at the weekend, has started just eight times in the league this season. With Gareth Barry on loan at Everton and Scott Sinclair at West Brom, the only other Englishmen who have appeared in the Premier League for City this term have been Joleon Lescott, Micah Richards and Jack Rodwell, who have made just 11 starts between them. Milner, along with Spaniard Javi Garcia, may hope to play a more significant role now key midfielder Yaya Toure has been ruled out for up to two weeks with a muscle injury. "I know what those players can give," added Pellegrini, who said it would be a challenge for his squad to overcome the disappointment of defeat by Liverpool as they prepare to face Sunderland at home on Wednesday. "Of course it is difficult, but I think the players are perfectly conscious what we are fighting for from now until the end of the season," he added. "Playing against a team in the relegation positions is very difficult. We play here at home, but I am sure they will try to fight to the end to continue in the Premier League." City captain Kompany is expected to start Wednesday's match, having overcome the knock that made him a doubt for the trip to Anfield. Striker Sergio Aguero is also expected to be named in the starting XI.